The most popular mount for attaching small to midsize devices in a vehicle remains a suction cup. A suction cup attaches to practically any surface that is smooth, non-porous and flat. The problem is that a dashboard is seldom smooth and non-porous. Sometimes it isn’t even flat. That’s where a dash disk comes in. A dash disk provides a smooth non-porous surface for a suction cup to attach. One side of the dash disk attaches to a car or truck dashboard. The other side is smooth, just like a windshield. Using a dash disk with a suction mount allows you to have a dual purpose mount. Use it on a windshield or a dash. This is especially useful in states where attachment to a windshield is against the law. The photo that accompanies this article has two types of dash disk. The one on the left is an adhesive variety and the dash disk to the right is the sticky non adhesive variety. We will cover both types and offer some advice to help you select the best for your application. Before selecting your dash disk, measure your suction cup. The diameter of the disk needs to be a little larger than the suction cup. The entire suction cup must fit within the disk diameter for effective adherence. Most suction cups are less than 80mm but there are some mega suctions that are much larger. 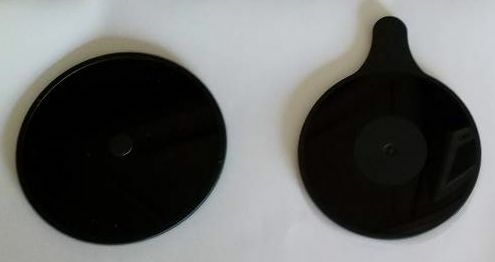 The majority of phone and GPS suction cups are less than 80mm. There are also some good guidelines to follow on applying any of these dash disks. First, be sure to clean the dashboard with an alcohol wipe. A dirty or oily dash will prevent anything from proper adherence. Secondly, those living in extremely hot climates might be best off skipping the dash disk and considering a bean bag mount. Lastly, let the dash disk sit unused for 24 hours after application. This allows everything to settle in. Read the directions from the manufacturer to ensure all proper care is taken. The adhesive variety is the most common type. As the name suggests, there is adhesive glue on one side of the disk. There are several types of adhesive on the market. A variety called Very High Bond (VHB) is the most permanent but most secure. It’s also the most difficult to remove. We offered some advice on removing a car adhesive dash mount in a recent article that is worth visiting if selecting this option. The Arkon 80mm Adhesive Mounting Disk is the one pictured to the left in the photo that accompanies this article. It’s 80mm (3.14 inches) across so most suction cup mounts will fit fine. The back is adhesive and you peel the coating paper off to expose the sticky side. Be sure to use the included alcohol wipe to clean the area for application. Also be sure you have everything lined up properly because you get one shot at this. An adhesive dash disk is not reusable. The iOttie Reusable Dashboard Pad is the other dash disk in the photo. Unlike the adhesive variety, this is reusable. Remove the clear protective coating to expose a sticky surface. Although no wipe is included, be sure to clean the dash area before application. The surface is a little smaller than the previous variety measuring about 75mm or 2.94 inches. When it’s time to remove the iOttie Reusable Dashboard Pad, simply lift the tab and remove. Wash the bottom with warm soapy water and let it dry. This recharges the sticky surface. This dash disk is flexible and may suit some contoured dashboards well. Which one to get? Both have been tested and work fine. In our experience, the better adherence comes with the adhesive disk but the reusable variety has its merits in that it can be used repeatedly and works better on contoured dashboards.